书籍简介: There is no doubt ...we live in changing times.The increased amount and rapid flow of information has placed organizations on ever accelerating paths of change.With a focus on the topic of change,The 2008 Consulting Annual can help you manage the change in your organizations. The Annual is a ready-make toolkit of ideas,methods,techniques,and models that assist and support your work as an organizational consultant,with an emphasis in the change management area.The materials provide highly accessible means of interacting with a diverse variety of systems and processes-from collaborative work systems and executive coaching to strategic planning and organization development. The volume includes change management tools.For example,Experiential Learning Activities(ELAs)are the mainstay of the Annual and cover a broad range of consulting topics.The activities are presented as complete and ready-to-use designs for working with groups:facilitator instructions and all necessary handouts and participant materials are included.Check out the ELAs by several well-known change leaders:Mary Broad,Karen Lawson,Bob Preziosi,and Ed Schein. The instrument section introduces proven survey and assessment tools for gathering and sharing organizational performance data.Kristin Arnold shares a tool for assessing the potential of partnering with another consultant. The articles section presents the best current thinking about workplace performance and organizational development.We are honored to have Karl Albrecht's submission about how unrealistic expectations can derail change.All materials can be freely reproduced for use in the normal course of your work. 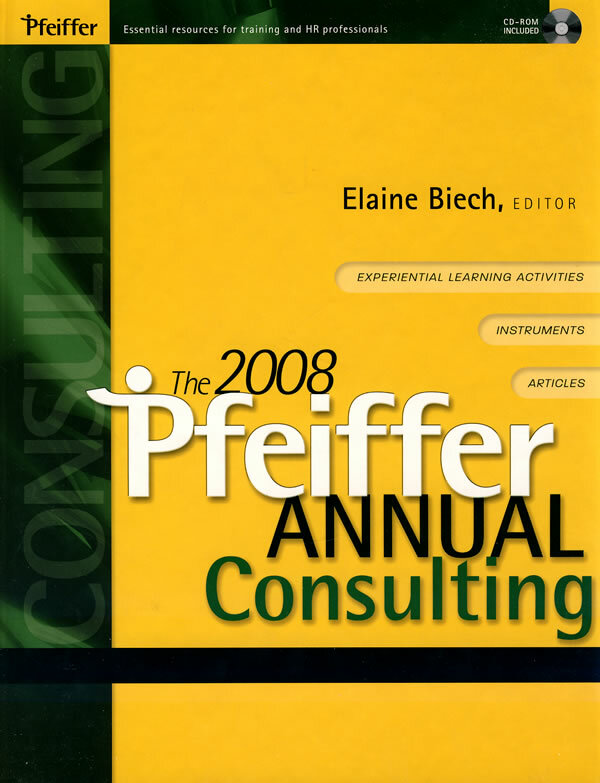 Year after year,the Consulting edition of the Pfeiffer Annual has provided thousands of trainers,consultants,facilitators,and managers with up-to-date information and tools to help make organizations more effective.So find out how other practitioners are improving organizations day by day:delve into the indispensable 2008 Pfeiffer Annual.You will understand why it is the best and most reliable source for practical,professional,performance-boosting tools.